The NVIDIA SHIELD TV Android Streaming Media Player recorded on Amazon USA for $139.99 & FREE shipping in the US. Lowest ever! "The world’s most advanced streamer". The Shield TV can stream 4K UHD videos with HDR. Inside there's an NVIDIA Tegra X1 processor with a 256-core GPU and 3GB of RAM. Internal storage is only 16GB, but is expandable with external USB3.0 flash drives. The main unit is rather small and weighs just 250gr. The OS is Android 7.0 Nougat, with Android TV and Google Cast. You can also use it to stream AAA games with the GeForce NOW cloud GPU service, which reportedly works quite nicely. You also get some exclusive Android games, available only on SHIELD. 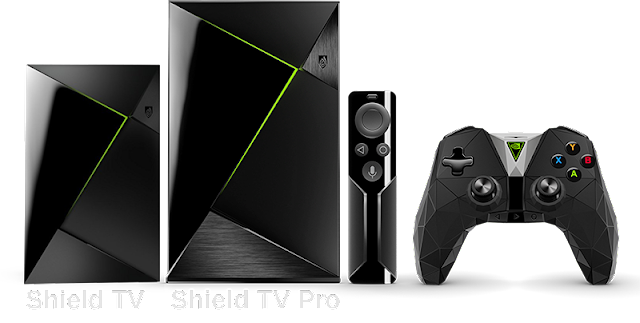 The SHIELD TV package includes the main unit, remote, 40W adapter, and the redesigned SHIELD controller. The SHIELD controller has a mic for voice search, dual rumble vibration feedback, headset 3.5mm jack for private listening, IR blaster for controlling TV volume/power and 60+ hours of battery life. The Shield TV Pro version recorded on Amazon USA priced at $273.82.